Body Transformation: Ryan Stafford Turned Fat Into Fortified Muscle! Jay Cutler provided an endless stream of motivation for Ryan to power through grueling workouts. See how he went from fat to fortified with single-digit body fat! I used to have no clue who I was and tried to fit into certain crowds just to be accepted, but it never felt right. I was 17 years old and just finished a long-term relationship. After the heartbreak, I realized that I was trying to be someone I wasn't to please another. One day, I came across an issue of "Muscular Development" at Wal-Mart with Jay Cutler on the cover. In that moment, I knew I wanted to be a bodybuilder. I was in awe at Jay's mass and physique. It was amazing to see someone who, in my opinion, is a superhero, and who proves anything is possible if you put in work and time. People around me immediately noticed changes in my attitude and appearance. I carried myself with pride and happiness. Many people said I was going through a phase, but there were others who truly believed in me. My life is completely different now. Lifting made me realize that time is precious. I don't want to waste a moment. I'm much more respectful to others now and have higher standards for myself. As soon as I purchased my first fitness magazine, I went straight home to read it. I started reading the diet articles and learned what to eat. I realized the only way to grow was to eat big and train hard. I trained after school but wasn't smart about nutrition, so I packed protein bars with me at school because I knew that school lunch wasn't enough. As I became more educated on nutrition, I prepared meals. There were a few days when I felt like giving up because results didn't show, but I always referred back to photos of Arnold Schwarzenegger and Jay Cutler for motivation. I watched motivational bodybuilding videos and envisioned how I wanted to look. I ate the majority of my carbs for breakfast, pre-, and post-workout meals. My other meals were low in carbs with high fat content to slow digestion and keep me satisfied. Recover and keep up your calorie intake. Most people complicate supplementation and forget about nutrition, the most important aspect. I learned early that supplements only increase results with a solid diet. Training came easy. I wasn't concerned about how much weight I could move. I lift as heavy as possible while maintaining good form. To make a muscle to grow, you must break it down and build it back with adequate amounts of healthy nutrition. Patience and hope kept me on track. My fitness journey has just begun. I hope to obtain sponsorships and earn a bodybuilding pro card. I've competed twice in the Julie Palmer's Ultimate Showdown and the Tricky Jackson Classic where I placed second in men's open lightweight bodybuilding. "To make a muscle to grow, you must break it down and build it back with adequate amounts of healthy nutrition." Acknowledge your weaknesses and build on them. Don't get discouraged at slow results. Take advantage of every day. 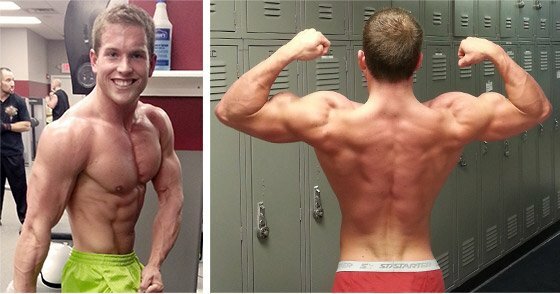 Bodybuilding.com provided supplementation advice and motivational messages to push me through bad days. Creating a BodySpace profile helped me track my goals and find other members willing to provide a helping hand.